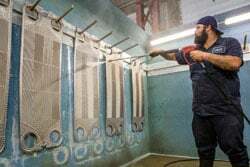 You can trust Alfa Laval technicians to repair and recondition your gasketed plate heat exchangers – no matter the brand. With over 500,000 parts in stock at our centrally-located distribution center in Indiana, we also have your parts needs covered. 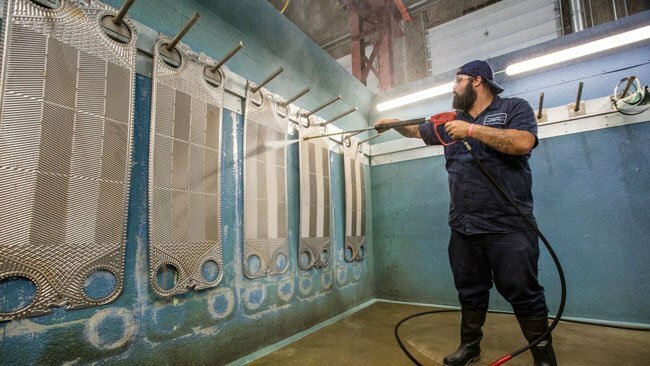 We’ve serviced equipment for over 125 years and recondition over 86,000 plates every year in the US. Five of our local service centers are outfitted with the equipment and expertise to optimize the performance of your gasketed plate heat exchangers. Two of the most common reasons for decreased efficiency in heat exchangers are old gaskets that cause external leakage and deposits such as scaling, which lower the heat transfer and eventually clog the channels. 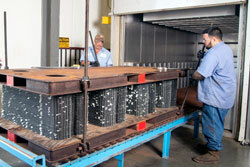 By reconditioning your heat exchanger, you can solve these problems. At Alfa Laval’s well-equipped service centers, our experienced technicians remove gaskets and scaling with specialized tools and chemicals. This prevents corrosion and creates an ideal surface for re-gasketing – without you having to handle the chemicals or waste. 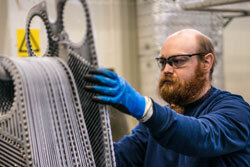 In addition, we thoroughly examine your heat exchangers, correcting any sealing problems or deformities. These services ensure your equipment continues to deliver high efficiency and optimal performance. 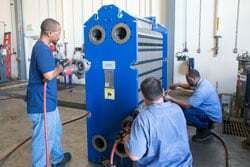 Plate heat exchanger frame repair service includes inspection, refurbishment, replacement of connection linings, and replacement of bolts or other frame parts. 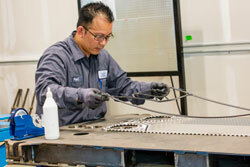 While reconditioning plates must take place at one of our service centers, some frame repairs can be performed onsite. Upon arriving at the service center, your heat exchanger plates are examined for major corrosion, erosion and deformities. Our technicians will determine whether the plates should be reconditioned or replaced. 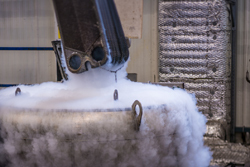 We use an efficient, yet gentle, method to remove the gaskets using liquid nitrogen or caustic soda, which completely removes the gasket while leaving the groove intact, preventing plate damage. Some field methods of removing gaskets, including using propane torches or rotating wire brushes, can severely harm the plates. 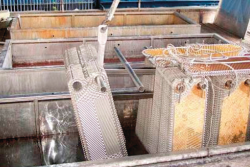 The heat exchanger plates are initially cleaned with water to remove residue. The plates are immersed in specially formulated chemical baths, whose concentration and temperature are carefully regulated for the gentle removal of deposits. 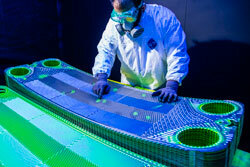 Each plate is sprayed with dye and then carefully inspected under UV light to find even the smallest defects. We carefully regasket the plates using a strong, 2-part epoxy glue, which is far superior to the rubber based contact cement used by other service providers. The plates are then placed in a curing skid and baked in an oven for 3-5 hours under compression. When the heat exchanger is reassembled, a full hydrostatic pressure test is performed to ensure there is no leakage. Finally, you'll receive a detailed heat exchanger service report, including the procedure documentation and recommendations based on your results. Alfa Laval maintains an extensive inventory of spare parts for your plate heat exchangers. Our centrally-located distribution center in Indiana has more than 570,000 spare parts in stock. With our cleaning services, process surfaces are restored to optimal condition, which lowers the maintenance costs and extends your equipment’s lifetime. Alfa Laval offers a range of Cleaning-In-Place (CIP) systems and cleaning agents, specially designed and formulated to remove deposit build-up effectively from heat transfer, separation and fresh water generator equipment. We only use carefully developed and environmentally sound chemicals. A Performance Audit verifies your plate heat exchanger is performing according to design specifications and helps identify areas where performance can be improved. A Performance Audit is especially useful when service intervals are difficult to predict and optimize. Data collection and measurement - a service engineer will visit your facility to visually inspect your units and to log data using a portable logger with four temperature gauges and a flow gauge. This process does not disrupt operations and usually takes about one hour per unit. Analysis of data - back at the office, the engineer runs the data through a thermal analysis software program that uses performance benchmarks for every Alfa Laval plate heat exchanger to derive your heat exchanger's optimal heat load. Audit report - you'll receive a report which will compare your heat exchanger's performance to benchmark performance and indicates if your plate heat exchanger requires service. Increase the performance of your gasketed plate heat exchangers to meet growing process requirements with our equipment upgrade services. If you already have an Alfa Laval gasketed plate heat exchanger, you may be able to replace you current plates with our next-generation plate pack to take full advantage of new plate features.